NAME : Connections - Face of Liverpool DATE : 2006 CLIENT : Beetham Organisation LOCATION : Liverpool PARTNERS : Landscape Architect: BCA Landscape, Designers: Smiling Wolf, PR Agency: Leapfrog PHOTOGRAPHER : Guy Woodland MANUFACTURE PARTNERS: Main Contractor: Carillion, Timber: Eves Joinery, Concrete: Evans Concrete. A site specific and dynamic, environment, a unique place built with a craft quality that tells a story now, and in the future. A design that takes into account significant business and residential use, a liveable space that overcomes the impact of the sites peculiar micro climate and heavy traffic. A design that celebrates the areas history and context within the commercial quarter of Liverpool, creating a new identity, communicated through each element of the landscape. An integrated design that overcomes practical difficulties, making sense of the scale of the buildings, pedestrian movement and usage. Our vision is to set an urban design ‘benchmark’ for the business quarter that will raise standards and aspirations sending out a message of well-being to the competitive global market. ‘Liverpool - Threshold to the Ends of the Earth’ quoted by Michael O’Mahoney in 1931 nicely sets the context and reason for the sites existence both past and present. The site is indeed at the threshold of national and international trade connections. The terminal basin canal cottages give visual evidence of a gateway to the East Coast along the Leeds-Liverpool canal and the adjacent Princes dock, a western gateway to the New World. The geometry and drama of the site is reinforced by the massive cor-ten wall, punctured by a circular opening and frame through which a vista is presented into a walled garden. From within this sheltered space, the visitor can find dramatic views of the sea and the city. A curved wall with the inscription in Morse code ‘Permission to come alongside’ faces travellers along King Edward street, and helps to frame another unique space. 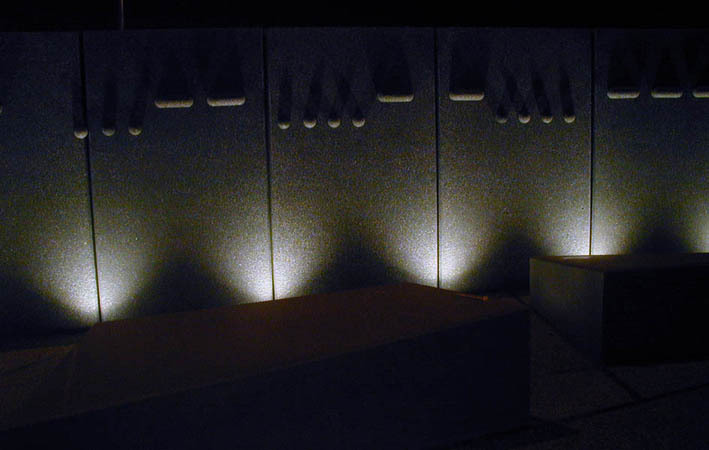 ‘The tower plaza’, sheltered from the heavy traffic, becomes another liveable space which houses unique sculptural seating and feature lighting. Throughout the scheme the emphasis is on creating a cohesive space that reflect the various functions of the buildings. 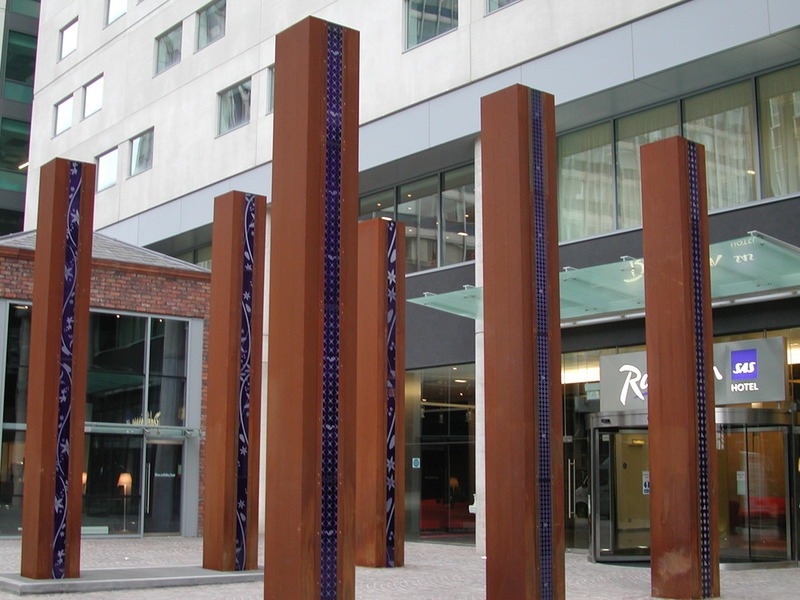 Throughout the whole scheme subtle intersecting lines, etched, cast, blasted, and illuminated, within walls and floorscape, link glass discs that identify the Liverpools around the world, and portray Liverpool faces of the world. The canal basin cottages are dramatically framed by an interpretative sculptural element and seat that illustrates the history of the Leeds - Liverpool canal. A grand hotel entrance is heralded by six illuminated beacons reinforcing the simple geometry, the symbol, and scale of the elements. The beacons also serve as vents to the underground car-park. We have not attempted to compete with the grand scale of the buildings, whose mere presence is a major statement of confidence in the City. We have articulated a vision for creating usable space with a distinctly local character and spirit, that acts as a humanising influence in the everyday use of the buildings by visitors and local people. It is also intended to be a celebration of Liverpool’s past achievements, renaissance and future potential. Set within the floor and walls are illuminated glass portholes. 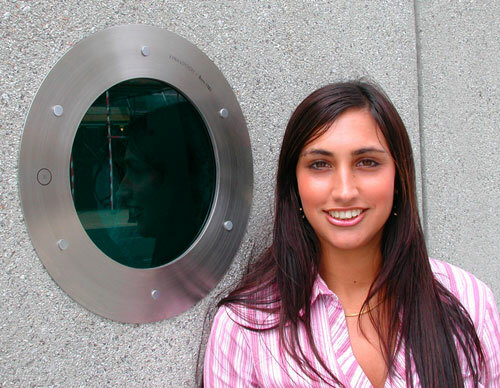 Contemporary faces of people that reflect the diversity of Liverpool’s culture, are etched into 32 of these glass portholes. Also etched into the 11 glass floor discs, are images that reflect the significant places around the world with strong Liverpool Connections. The faces represent in some part Liverpool’s diverse gene pool, pioneers, traders, travellers, migrant people, throughout history and from all over the world, who have made Liverpool their home. 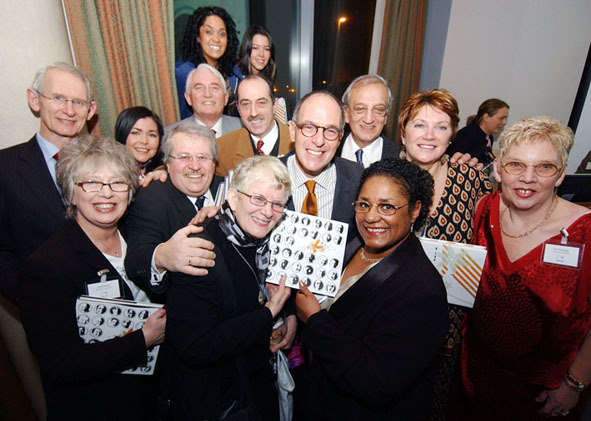 These faces were sought out with the help of Leapfrog PR company and their story of immigration recorded. Their portraits were photographed by Guy Woodland and their image screen-printed onto the blue glass discs, with a short sentence engraved into the stainless steel edge identifying their name and place of origin. The glass was then permanently fixed into the walls of this public garden. "From the outset, our vision as artists and designers was to create a space to accommodate people; a new public realm that could be successfully inhabited. It is a space that enlivens the senses, and evokes memory and imagination, as well as overcoming the physical difficulties of the site’s extreme micro-climate and heavy traffic flow. The life of the project is now so much bigger than its designers and makers. It is owned by the brave souls and their families, who agreed to tell their very personal stories of departure and arrival – the ‘Faces of Liverpool’. These faces have shared not only their image, but their life story for this and future generations, inspiring courage for both the alien and the community that welcomes their diversity. They have granted the stranger ‘permission to come alongside’. 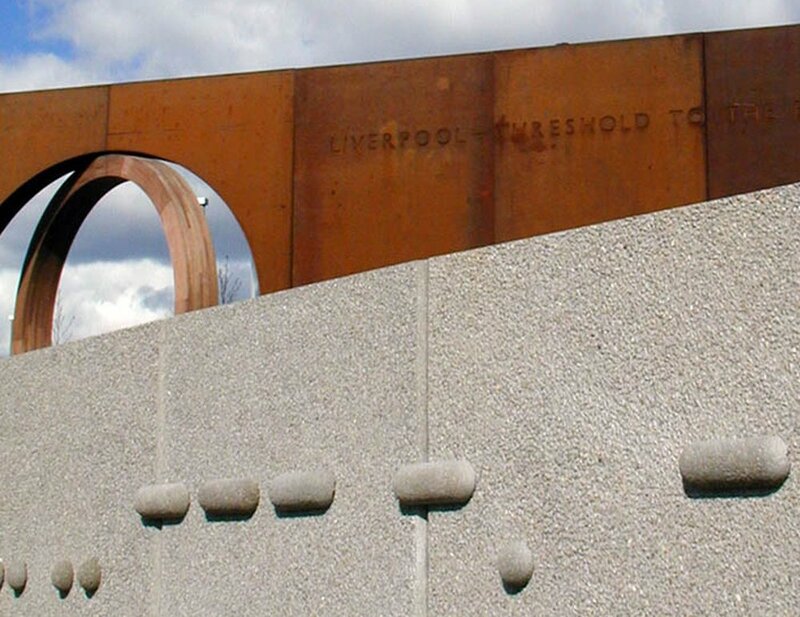 Michael O’Mahoney’s 1931 quotation, ‘Liverpool – threshold to the ends of the earth’ sets the context and reason for the site’s existence, both past and present – and itself forms an integral feature of the garden. The site is indeed at the threshold of national and international connections... of arrivals and departure. The Terminal Basin canal cottages give visual evidence of a gateway to the east coast, along the Leeds Liverpool canal; the adjacent Princes Dock is a western gateway to the New World. The new Passport Office and Radisson hotel also strengthen these international connections. 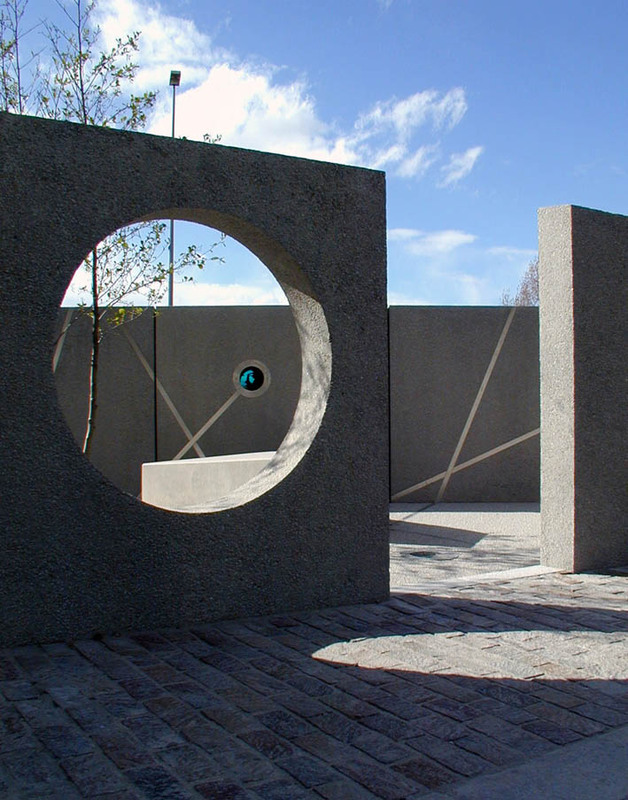 Sculptural elements integrated within the landscape make these connections, and evoke stories of travel, trade and adventure using simple geometry, symbols and maps. 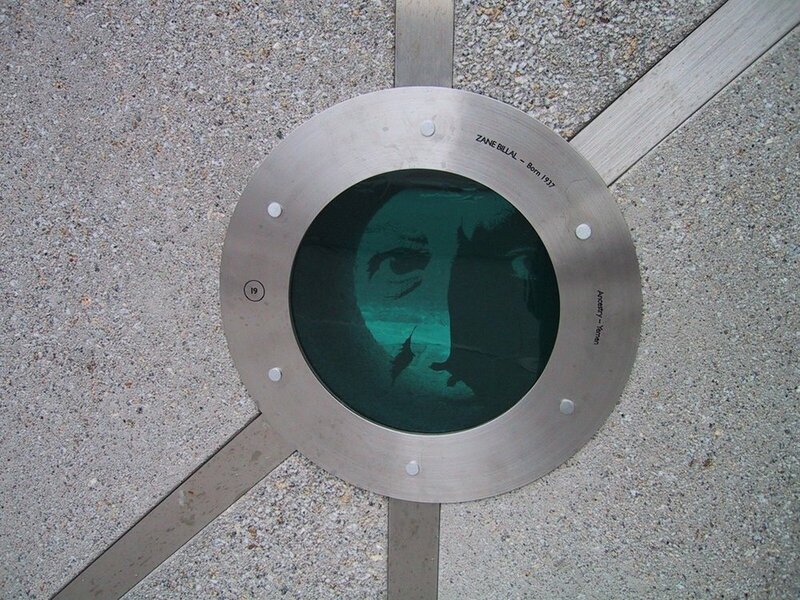 Throughout the whole scheme subtle intersecting lines, etched, cast, blasted, and illuminated – within walls and floorscape – link portholes that portray 32 Liverpool faces of the world. These contemporary faces represent in some part Liverpool’s diverse gene pool: pioneers, traders, travellers, migrant people, or visitors that simply stayed, throughout history, from all over the world. They are all people that have made Liverpool their home."